How much did you spend on your last smartphone? Even if you wanted a cheaper option than a flagship phone, I expect it was more than US$4. But that's what Indian manufacturer Ringing Bells is doing – it has created a smartphone that you can buy for only US$4 (about £3, AU$5). You may ask how a company can afford to do this - the answer is it's taking a US$2 hit on every phone it makes. The Freedom 251 comes with a 4-inch 960 x 540 display, a 1.3GHz quad-core processor, 1GB of RAM, a 3.2MP rear camera and a 0.3 selfie shooter. That's not the worst spec list I have ever seen and from photos of the device it's a good looking phone. According to CNET, a Ringing Bells executive said each Freedom 251 costs US$20 to make. The company has then partnered with a number of software companies to preinstall apps on the device and bring the cost down to US$6 a unit. By selling them for the equivalent of US$4 each, that means the company is losing US$2 on every sale. That already feels like a strange business model, but the more I've dived into Ringing Bells and the world's cheapest ever smartphone, the more I've learnt. When the phone was officially announced, Ringing Bells revealed its device to the press in a hands-on section. Some eagle-eyed reviewers pointed out a strange white material at the top of the device which, when removed, according to Android Authority, showed the Freedom 251 was in fact a disguised Adcom Ikon 4. That's a Chinese competitor phone that would usually ship for US$54. Adcom haven't taken legal action, but the company has officially revealed it did not realise it's devices were being used in this way. Then in March this year, Ringing Bells was put under official police investigation under Section 420 of IPC and the IT Act. That essentially means cheating and the police are interested in how the company is selling the phone for such a low price. The company has been open with the police and is cooperating, but since March there hasn't been an update on the progress of the investigation. On July 7, Ringing Bells GM Anmol Goel told the Indian Express, "We may deliver more units if we get help or we may not deliver at all in the upcoming months." That help Goel mentioned is a strange thing. Mohit Goel has now written a letter to the Indian Prime Minister's office– dated June 28 – that asks to meet the PM to ask for the equivalent of US$7.4 billion. That's right… this small phone manufacturer is asking its government for US$7.4 billion - more than the GDP of Niger, Gibraltar, the Isle of Man or Malawi. The letter requesting the money reads, "We have brought 'Freedom 251' which we offer on 'Cash on Delivery' terms but we have a gap between the BOM (Bill of Materials) and the Selling Price. "We, therefore, humble [sic] request government support to actualise the objective to cascade the availability and usage of smartphones all through the far reaches of our great nation." Ringing Bells would like to put a phone in the hands of everyone across India – that's no mean feat with a population of over 1.2 billion - so it makes sense the company needs that much money. Goel wants to connect this with the Digital India campaign, launched for the Indian PM last year with the aim of making the country more digitally empowered by increasing digital literacy and increased internet usage. Ringing Bells has now claimed it wouldn't even need the US$7.4 billion itself though. Instead Goel has said he's happy for the government to give the project to another manufacturer. "The government can make the phone - under our Freedom brand - from some other vendor. I have no objection to it. To make such phone for every Indian citizen, the government needs to allocate funds from its Digital India initiative", Goel said. The skeptical amongst the tech community have speculated the Freedom 251 has been a publicity stunt all along. Ringing Bells has announced a number of new, more expensive phones that cost quite a bit more than US$4, and it's easy to see how people feel it may have been used to garner press for more expensive devices. 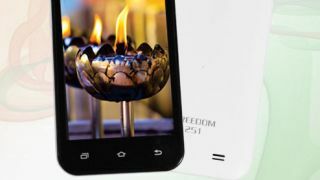 The new line-up, announced on the day the Freedom 251 began shipping, includes four feature phones, two Android smartphones, an LED TV and a number of power banks. These devices are much more appropriately priced with the Elegance Android phone priced at about US$60 (£45, AU$80) while the Elegant smartphone costs about US$65 (£50, AU$90). According to Goel's comments, the Freedom 251 may be dead before it's even properly released as well. His quote was, "We may deliver more units if we get help or we may not deliver at all in the upcoming months." When the phone was initially announced over seven million people registered to buy the phone before the payment gateway crashed after three days. Ringing Bells then promised to ship 2.5 million units by the end of June. A few months later, Goel then told the Indian Express it couldn't meet the insane demand and would ship 200,000 units instead. That then dropped down to 30,000 and now it's only shipping 5,000 units. Goel claims it may not even release more than the 5,000 units despite over seven million people being interested in the device. TechRadar has tried to contact Ringing Bells on the points raised in this article, but so far we have yet to receive a response. People around the world have now heard about the Freedom 251 smartphone as the cheapest device in the world - and even if it was a publicity stunt all along, this has made for one of the most fascinating stories in the tech world for quite some time. I just can't wait for it to get inevitably even weirder.